Holy moly, my cooking blog gets all the attention and I don’t get over here enough! 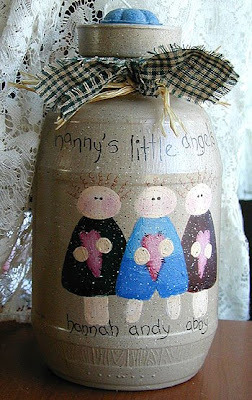 I thought I would post these cute little angel jars. When I had my store I used to take orders and paint these for aunts, grandmas, and for women attending baby showers. They were a great personalized gift and were pretty popular. « Scapper Contest & Cooking Contest! I have a request for your angel jar. I am a mom to two angles, Erik and Payton I belong to a group of grieving mothers. We have a gift exchange coming up for mothers day. 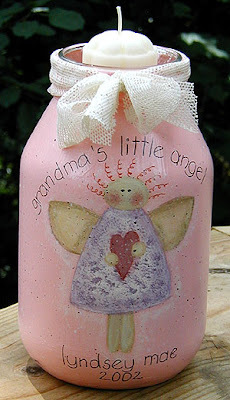 I was wondering if you would make a special jar for the mother I have she has two angels also. 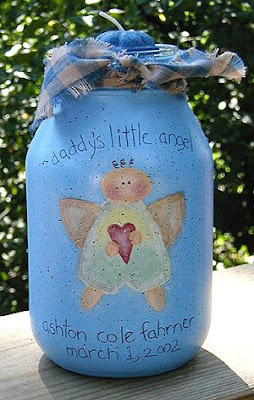 I can get their names and if you could we all have different things that remind us of our babies could you paint those on the jar as well? I love these jars. I am not good at this kind of stuff but if there is a pattern with instructions I would like to try them. If you can email me the instructions that would be great. I can relate to the ‘neglect’ issue….it’s difficult to juggle sometimes. I do love this site thought…I gave my daughter in-law the link to it.